Sometime between 1304 and 1328 on April 12, 1945, Ensign Heiichi Okabe took off from Kanoya Air Base as pilot in a Zero fighter carrying a 250-kg bomb and died in a special (suicide) attack east of Yoronjima at the age of 23. 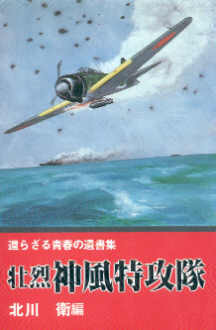 He was a member of the Kamikaze Special Attack Corps 2nd Shichishō Squadron from Genzan  Naval Air Group in Korea. He was from Fukuoka Prefecture, attended Taihoku Imperial University in Taiwan, and was a member of the 14th Class of the Navy's Flight Reserve Students (Hikō Yobi Gakusei). Finally I became a Special Attack Corps Kamikaze Special Attack Unit member. Will the next thirty days become my true life? My opportunity has come. Training for being able to die is waiting. It will be rigorous training so that I can die beautifully. I will go as I am watching the country's grim condition. With my entire youth put into thirty days, my life will go fast. I am a single human being. I am neither a good person nor a bad person. If I am not a great man, I am not a fool either. To the end I am a single human being. As a wanderer sent off on a trip who until the end longed for life, I want to end like a person as a human document and sanctified area. It was a world with too much noise. Since there was not a single great leader, in the end there emerged a society with endless tumult. We need to build a more rational and calm human society. We gladly will attack in the midst of the country's hardships. We will destroy enemy ships assured in our ideals that Japan always will be a great country where only beautiful hometowns, strong women, and beautiful friendships exist. What is today's duty? It is to fight. What is tomorrow's duty? It is to win. What is the duty of all days? It is to die. As we in silence go to die, I want scientists in silence to die on the science front. At this time Japan may be able to win the war. If by some chance Japan can win the war shortly, I must say that it would be a fatal misfortune for the people. With easy ordeals, the people will only be weakened. Both Shikishima and Yamato are poetic names for Japan. The diary entry and poem come from Kitagawa (1983, 152-3). The biographical information in the first paragraph comes from Kitagawa (1983, 152) and Osuo (2005, 200). 1. The Korean pronunciation of Genzan is Wonsan. It is located on the east coast of North Korea.